The most critical thing to understand about Venice is that it is a island, or better, a clutch of 118 islands, perched in the middle of a blue-green lagoon. Until the early 1930s this assemblage of islands was completely surrounded by water and accessible only by boat; thanks to the 2.8 mile causeway that was constructed mid-20th century, you can arrive today by car, bus, motor coach, or train directly into Venezia Santa Lucia Station. A number of water transportation options remain as well, including ACTV public transit, a private transfer company called Alilaguna, serving the airport and the port, and the private water taxi, or motoscafo. Which of these means will be most convenient for you will depend on how your arrive — or depart. 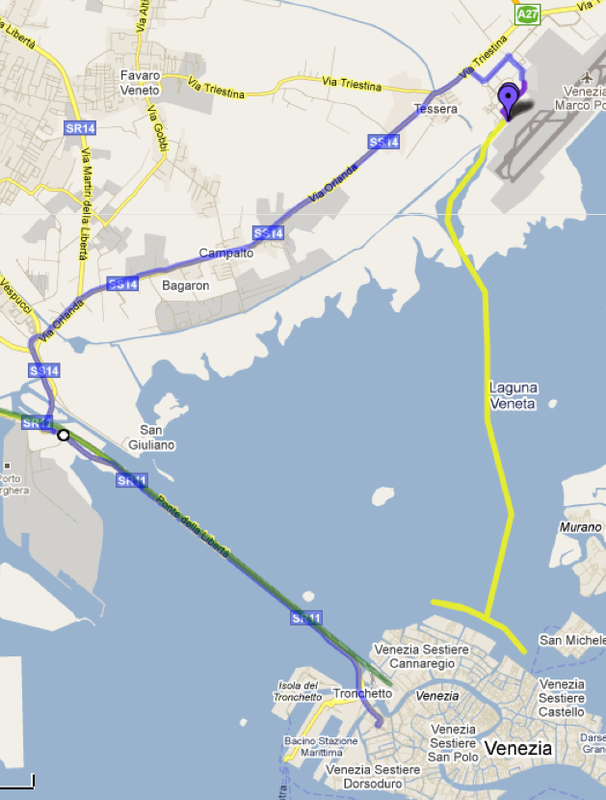 The good news is that the Venice’s Marco Polo airport is new, small, and easy to manage. It’s not a hub, but a destination, which help reduce the Foreign Airport Intimidation Factor significantly. Like the airport, the Venezia Santa Lucia station is a destination, not a hub, and so is not large. It can become quite busy, but is still fairly easy to navigate and find the information you need. Your goal to be to drop your car, not to park it — because no matter what, you can’t drive a car in Venice. Cruisers transfer options are similar to those of flyers…they’re just closer to Venice than those who arrive at the airport.